There are many problems affecting the environment today. The list of issues can go on and on and on. These issues may seem like they only affect one specific ecosystem, but in actuality, it affects everyone. Every issue indirectly affects all other ecosystems. For example, the carbon dioxide (CO2) and other pollutants released from cars and factories may seem like they only go up into the air and destroy the ozone layers, but they actually affect the people and organisms in the area. The issues, directly and indirectly, affect every ecosystem. One area that is being affected is the sea. One big issue for waterways and lakes inland are caused by releasing and dumping waste into them. Factories and mining do this. By adding new material, not presently in that certain ecosystem, will cause change; not knowing the effects will be. Dumping waste into waterways never goes will. Mining dumps metals into waterways. Tiny amounts of metals can be okay for many aquatic organisms. But if the amount exceeds the limit the organisms can take, it will become toxic. 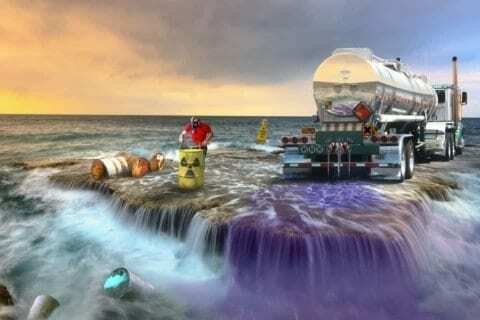 When the metal waste is dumped by corporations, the metals are then dissolved into the water. Fishes and other organisms can then absorb the metals through a process known as bioconcentration. The term means when an organism has absorbed more chemicals than the environment the organisms are in. The metal can affect the organisms reproduction, growth, and metabolism. There are a few common metals that are dumped in aquatic ecosystems are mercury, lead, cadmium, and chromium. These metals react differently to the different type of waters. There are two types of water: soft and hard. Soft water has a low concentration of calcium ions; hard water has a high concentration of calcium ions. Calcium and other minerals protect organisms from absorbing the metals. For example, Mercury is more toxic in soft water than hard water because there are fewer calcium ions to protect the organisms. Each metal can affect organisms directly and indirectly. Cadmium starts a production of a low molecular weight protein called metallothionein. This protein is then released to bind to the metal and decreasing the toxicity of Cadmium; thus protecting the organism. But if there is a huge amount of cadmium, the metallothionein will become overwhelmed and the extra cadmium will affect the organism. Many of these metals affect the organisms on the inside. They affect things like the structures and organs of the organisms. Like cadmium affects the hepatopancreas of aquatic organisms. Not only do these metal affect aquatic organisms, but also humans as well. Scientist first discovered a major metal contamination affecting humans was in Minamata Bay, Japan in 1950. They called the illness Minamata Disease. People had a decrease in hand-eye coordination, memory loss, speech impairments, blurred vision or blindness, weakening of muscles, and in extreme cases death. The scientists discovered that the bay was contaminated with a high concentration of a type of mercury called methylmercury; the most toxic form of mercury. A factory had been discharging mercuric oxide upstream, which then bacteria and bioconcentration transformed the metal into the toxic form. The fish then absorbed the metal and the people ate to fish. Metals affect everything around that certain ecosystem. With cleaning up every body of water and preventing factories from discharging waste into the environment, our environment will become healthier and better for generations to come. The process will take a lot of time and effort to clean up the pollution humans have caused, but the results will be better in the end. The Effects of Aquatic Pollution by Tanner is licensed under a Creative Commons Attribution-ShareAlike 4.0 International License. The Price of Being a Woman in PrisonWhat do athletes do before any game to handle stress and pressure? I look forward to hearing more about this subject from you.